Dinosaurs! Uh, no, just komodos and iguanas with horns and spikes duct-taped to them…. Didn’t matter when you were ten. And THE LOST WORLD (the second film adaptation of Arthur Conan Doyle’s 1912 novel) is definitely FOR ten-year-olds, seemingly made BY ten-year-olds. Been decades since I read the book, but screenwriter-director Irwin Allen takes Conan Doyle’s exciting meat and potatoes story, changes it unnecessarily to accommodate his interminable padding (the gripping “volunteers” segment, the compelling “arguing-over-taking-a-woman” vignette, the tension-wracked “tentacles-that-don’t-kill-anyone” obstacle, the thrilling “walking-slowly-through-the-dead-dinosaur-ribcage” scene – there’s more padding here than in Kiera Knightley’s bra) – then Allen adds cheese and plastic. Spikes, horns, sails, spinal plates, head frills – all lackadaisically taped to plodding komodo dragons, soporific iguanas and an unfortunate caiman, which made them look like dinosaurs to people with the intelligence of cavemen. We can expect bad effects from pre-CGI movies, but THE LOST WORLD fails for many other reasons: foremost being its blatant disinformation, voiced via its ignorant characters, and by association, the ignorant filmmakers. After being “chased” by a forced-perspective komodo with a taped-on frill (roaring like an explosion coming through a tunnel), Challenger says, “We’ve just been visited by a Jurassic Brontosaurus!” If I can stop my head from exploding in outrage, I’ll outline why this statement proves Irwin Allen’s braincase is as small as outmoded thinking perceived dinosaur braincases to be: Brontosaurus (correctly termed Apatosaurus) was known since the late 1870s. Even schoolkids in 1960 knew Brontosaurus. (Exactly how retarded does Allen think his audience?) And if you knew Brontosaurus, firstly, you knew this sleek, splay-footed lizard looked NOTHING like the bulky, tree-limbed Brontosaurus. You also knew it was a herbivore, and herbivores don’t chase people to eat them – unless they are taunted by magnificent overacting. At least those stop-motion dinosaur movies of the time displayed a level of art and ingenuity, in trying to portray dinosaurs at the state that science knew them. The great Willis O’Brien is listed as an effects technician, but I think he just lent his imprimatur to this farce, and let the buffoons in the effects department go nuts with animals and glue, while he sat in the corner and read a good book. Truly, these people just don’t care! It’s like that maverick mediocrity Bert I. Gordon in KING DINOSAUR (1955), calling a forced-perspective iguana a Tyrannosaurus rex and expecting everyone in his audiences to squint real hard. 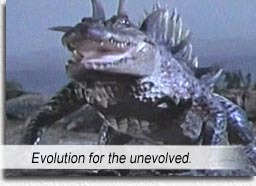 In this movie’s defense, it came during an unenlightened age, when biological science took a step backwards and started regarding dinosaurs as big dopey versions of modern lizards. Very soon, it would be realized that dinosaurs were not reptiles, but Dinosauria, their own genus. They resembled reptiles as much as this movie resembled JURASSIC PARK. Their physiology, movement, bone structure, habits, appearance – were nothing like reptiles. 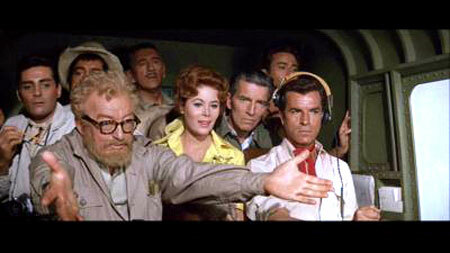 After the eight mismatched explorers stand around yammering for a good part of the film’s running time, all standing facing the fourth wall to get their screentime on like an episode of FRIENDS, they are kidnapped by white-skinned natives who look suspiciously like extras who can’t act. Naff subplots about diamonds, past expeditions, Lamas sacrificing his life to save the others by letting a doll that looks like him fall into some lava…enough cheese and plastic to make a modern corporate theatre hotdog proud. aka: SIR ARTHUR CONAN DOYLE’S THE LOST WORLD. Writer: Arthur Conan Doyle, Charles Bennett, Irwin Allen. Starring: Michael Rennie, Jill St. John, David Hedison, Claude Rains, Fernando Lamas, Richard Haydn, Ray Stricklyn, Jay Novello, Vitina Marcus, Ian Wolfe.